Looking for the best way to deter opossums in 2019? Then you've come to the right place! The deterrent works by utilizing a system of flashing light patterns to ward off opossums that may want to create a den in your yard. Opossums are naturally shy animals, and will more often than not give in to their passive nature if presented with a hostile environment. This device creates such an atmosphere with its blinking red lights, making your yard feel unsafe for opossums looking for a new place to call home. The manufacturer offers a warranty for three years on this device, meaning that your satisfaction is guaranteed for this time. 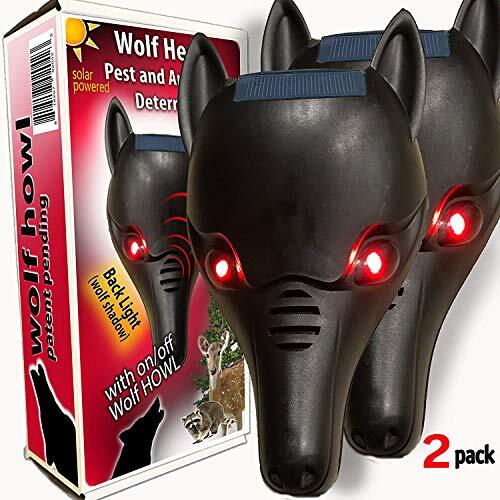 We chose this product as our top pick not only because if its simplistic design but because it's affordable, it's guaranteed by its producer, and it is versatile in deterring all sorts of unwanted nuisance animals like raccoons. Be sure to check out our detailed guide below to see what we have to say about the competitors, as well as some key information about opossum deterrents! What Is An Opossum Deterrent? What Are The Types of Opossum Deterrents? Is A Deterrent The Same As A Repellent? If you're not totally sure what a deterrent actually does, we're here to help. We've got all the information you need to uncover the questions you have about what deterrents actually do and how they can help you with your opossum problem. Just keep reading! Will a deterrent kill an opossum? If you've read a little bit about opossums before, you'll know that it's illegal in many areas to release them into the wild after trapping them on your property. Going hand-in-hand with this information, it's also illegal to use rodenticide as a poison for opossums. These animals are protected by wildlife laws, and killing them can bring about serious consequences. When shopping around for a deterrent, it's good to be mindful of anything that may bring mortal danger to an opossum. The items we've listed in our buying guide will only frighten the animal or give it a mild jolt of pain, but will not kill it under any circumstances. Most deterrents utilize fear of predators and sound in order to evoke a natural desire to flee an area, but some people do tend to get creative with their deterrent methods. In these cases, there could be danger or violence to the opossum. For example, some people install sharp-pointed, steel bird spikes in an attempt to deter opossums. The animal can impale itself on these spikes, which is both inhumane and deadly. Why does an opossum come to my yard in the first place? If you're wondering why your yard is such a hotspot for these nuisance animals from the get-go, there are a few different reasons. As shown in the video below, opossums normally flock to an area to clean up a mess. And, to quote the video, "the messiest animals in the forest are humans." Is every kind of opossum deterrent the same? Unsurprisingly, the answer is no. There are actually no deterrents made for just opossums. Each deterrent on the market is created to target a much wider range of nuisance animals, and opossums just happen to fit the bill. Because opossums (and many other creepy creatures you don't want in your backyard) are nocturnal, manufacturers have designed deterrent devices that work with sound and light. These devices (like many in our buying guide below) blast out signals to confuse and upset the opossum, mimicking danger signals and scaring them away. Sometimes, the deterrent devices are even designed in the shape of predators' silhouettes in order to up the ante! If you use a deterrent marketed toward another species entirely, you're bound to run into some luck for opossums. For example: did you know that opossums are excellent climbers? These little guys are adept at climbing trees and will regularly scoot up branches in order to escape from predators. The same skill set that gives them their tree-climbing ability also affords them another valuable trait: a fence-climbing ability. By using the same sort of deterrent one might use against birds, you can combat an unexpected skill that not many people know the opossum possesses! If you've ever confused repellents and deterrents, we understand. It's an easy mistake to make. Here's how you can differentiate between the two. Deterrents work to keep pests and nuisance animals from infesting a property in the first place. Repellents work to drive away pests and nuisance animals once they're already there. Generally, deterrents work through use of long-distance scare tactics like sensory awareness and light pinches of pain in order to snap an animal into realizing that a certain area isn't a suitable place to live. Repellents rely mostly on short-distance scare tactics such as predator urine and electromagnetic waves to accomplish this task. Click here for more information on opossum repellents. The primary reason we chose the Predator Guard Solar Powered Predator Deterrent Light as our top pick for an opossum deterrent is its ease of use; after the initial setup, you don't have to do anything! The device works as it charges under the sun during the day. At night, the power harnessed by the sun's rays are put to good use as it flashes and scares away shy opossums (among other animals lurking around). What we love the most is its pattern of flashing lights, which alternate and work to confuse the opossum. 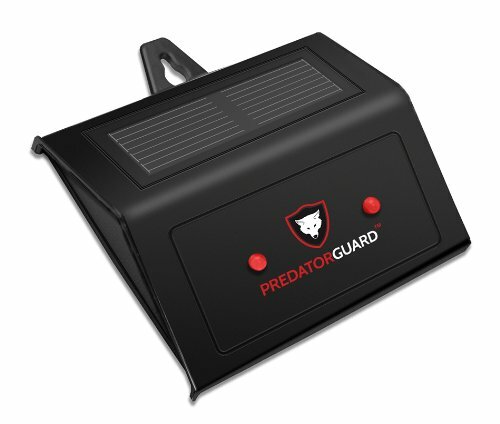 This device comes with a 3 year warranty from the manufacturer, Predator Guard. One AAA battery is required to operate the device, and this battery is recharged by the solar panel installed on the device. There are no frightening sounds or electromagnetic waves involved with this device, as is custom with an electromagnetic pest repeller. It's totally safe to mount this machine in backyards where dogs, cats, and kids run around. We endorse this device to those who are looking for a safe, green way to deter opossums and other nuisance animals from their backyards for the long-term. 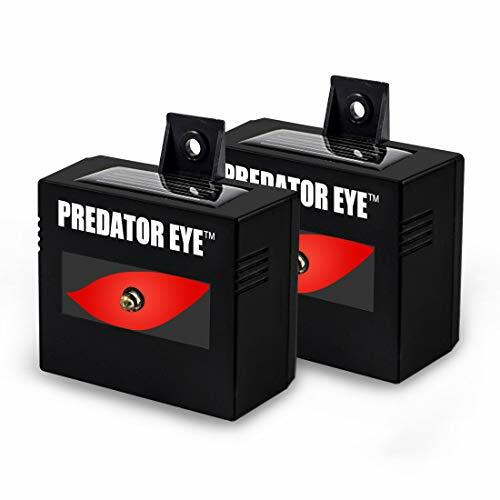 Like our top pick, the Aspectek Predator Eye Night Time Solar Powered Animal Deterrent utilizes a system of flashing lights to startle opossums and create a hostile environment in your yard. This device is weatherproof and designed to work in all climates, rain or shine. The manufacturer claims that the machine is water-resistant, meaning that you won't need to worry if you live in an area with heavy rainfall. One aspect that we love about this particular device is that the flashing light mimics a home security system, which works to deter not just opossums, but trespassers as well. The device is solar-powered and easy to set up. After mounting, you can rest assured that your device will begin working once the sun goes down! This deterrent ships in a two-pack, which means you can outfit your yard with double the power for half the price. In contrast to the other deterrent methods on the list, we're taking a bit of a turn with our next recommendation: Abco Tech Bird Spikes. Even though these are marketed to prevent birds from landing and nesting on your fencing and ledges, we found that they can prevent opossums from coming into your yard! How can this be? Well, because opossums are such skilled climbers, it's not outside the realm of possibility for them to take a leap over a fence or a guard rail to get to your property, and Abco Tech Bird Spikes offer just the preventative solution. We love these spikes because they are lightweight yet durable, affordable, and they ship to you in a package of 10 strips. 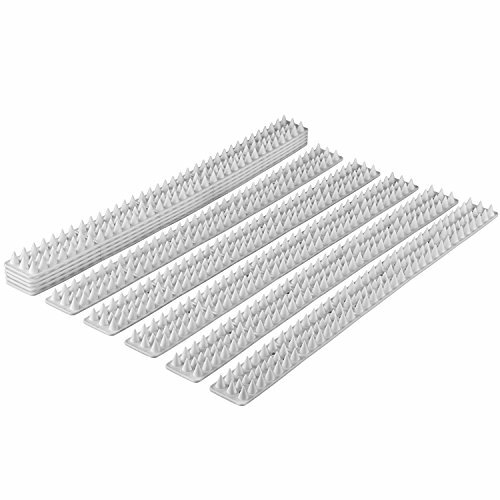 You can line your fence with these strips in order to protect your yard, and rest assured knowing that you'll remain opossum-free. Circling back to the other types of electronic deterrent devices on the list, we chose our final contender based on its creativity. The iPrimio Wolf Head Predator Deterrent is, essentially, exactly what it sounds like: a device in the shape of a wolf head. The wolf head is outfitted with two glowing red "wolf eyes" which flash intermittently, as well as a backlit shadow to illuminate the silhouette of the head in the night. Every half hour, the device howls like an actual wolf, which works to scare off any opossums hiding out in the area. Human ears can only hear the wolf howl from 30 feet away, but the frequency hits animal ears from 1/4 of a mile in distance. The iPrimio Wolf Head Predator Deterrent ships in a two pack, so it's ideal for large backyards and gardens. In addition, it's weather-proof, solar powered, and equipped with an on/off switch. Here's the bottom line: your yard is yours. You don't want opossums in it, and that's why you need a quality opossum deterrent to get the job done. In addition to opossums, you can deter other animals prowling around your backyard...both big and small!